Illustration courtesy of Hawke Optics. The Hawke Optics binocular line grows more popular and broader with each passing year. 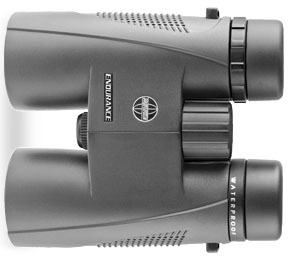 The current Hawke #HA3944 Endurance 8x42 roof prism binocular set runs about $199 discount retail price. At that price point, it is as versatile a binocular as can be had at this affordable price point. The “PC” as part of the name means phase-corrected. They are roof-prism binoculars that weigh about 25 ounces and have a 426 foot field of view at 1000 yards. There are a lot of reasons that I like these particular binoculars and it isn't just the image quality. The textured, waterproof, rubber grip feels good in the hands. They are stable when hand held and the three-position twist-out eyecups stay where you put them. They are smooth and easy to focus. They fold smoothly out and in to adjust the inter-pupillary distance. The supplied case, and even the padded neck strap, are excellent. Internally, they are purged and filled with inert nitrogen to keep them waterproof and fog proof. I'll take the 5.25 inch exit pupil every time from an 8x42 set vs. an 8x32 set, for the difference in bulk and price isn't that great. These are still fairly compact binos that weigh a bit over three-quarters of a pound. One of the binoculars I've used most over the last seven years is no longer available, a set of $429 (in 2006) Burris Signature Select 8x42. There were excellent back then and still are today. These Hawke units, at a fraction of the price, are nearly identical in performance. Endurance PC's are also available in 8x32, 10x32 and 10x42 configurations. If you want a satisfying set of binoculars at the two hundred dollar price point, all I can say is buy these Hawke Endurance 8x42s. They are all-around excellent in image sharpness, handling, feel and build quality.